INTRODUCTION: The pharmaceutical industry has engendered considerable interest making it a major participant in the healthcare industry. The advances and progress made by pharmaceutical industry have greatly contributed in terms of treatment of disease, thereby enhancing the quality of life 1. Over the time, scientists and researchers in the drug development industries are focusing on alternate routes of administration to add to the potential of approved drug products, or to overcome the drawbacks of the oral route. Although oral route is preferred for administration of drugs, it is associated with some restrictions for example: hepatic first pass metabolism, local GI toxicity and enzymatic degradation within the GI tract. One strategy that has been reasonably successful to circumvent such problems is to deliver drugs systemically via an alternate route of administration such as intranasal (IN), buccal/sublingual, pulmonary, or transdermal (TD) 2. Transmucosal routes of drug delivery which comprise of the mucosal linings of the nasal, rectal, vaginal, ocular, and oral cavity offer excellent opportunities and potential advantages over peroral administration for systemic drug delivery. These advantages include possible bypass of first pass effect, avoidance of presystemic elimination within the GI tract and depending on the particular drug, a better enzymatic flora for drug absorption 3. The sites of drug administration in the oral cavity include the floor of the mouth (sublingual), the inside of the cheeks (buccal) and the gums (gingival) 4. With the advances and progress in biotechnology, hydrophilic high molecular weight therapeutic agents such as proteins and peptides are readily available for therapeutic use. However, when administered by the oral route, these agents suffer from problems such as degradation and poor absorption. To overcome these obstacles and for successful delivery of proteins and peptides, the buccal route of drug delivery has acquired significant attention 5. In view of the systemic transmucosal drug delivery, the buccal mucosa is the preferred region as compared to the sublingual mucosa. One of the reasons is that buccal mucosa is less permeable and is thus not able to elicit a rapid onset of absorption and hence better suited for formulations that are intended for sustained release action. Further, the buccal mucosa being relatively immobile mucosa and readily accessible, it makes it more advantageous for retentive systems used for oral transmucosal drug delivery. Over the past few decades, the concept of use of bioadhesive polymers to prolong the contact time has gained remarkable attention in transmucosal drug delivery. Adhesion as a process is simply defined as the “fixing” of two surfaces to one another. Bioadhesion may be defined as the state in which two materials, at least one of which is biological in nature, are held together for extended periods of time by interfacial forces. In the pharmaceutical sciences, when the adhesive attachment is to mucus or a mucous membrane, the phenomenon is referred to as mucoadhesion 6. Thorough and vast research over the past few years has resulted in profound advances in understanding the concepts and aspects of mucoadhesion. To accomplish site-specific drug delivery, a lot of interest has been turned on to the concept of mucoadhesion, which encompasses a pharmaceutical formulation incorporating mucoadhesive hydrophilic polymers along with the active pharmaceutical ingredient (API). The rationale being that the formulation will be ‘held’ on a biological surface for localized drug delivery and the release of API will be close to the site of action leading to enhanced bioavailability 7. In the early 1980’s, Professor Joseph R. Robinson at the University of Wisconsin pioneered the concept of mucoadhesion as a new strategy to prolong the residence time of various drugs on the ocular surface. Over the years, mucoadhesive polymers were shown to be able to adhere to various other mucosal membranes. The capability to adhere to the mucus gel layer which covers epithelial tissues makes such polymers very useful excipients in drug delivery 8. Mucoadhesion is known to increase the intimacy and duration of contact between drug- containing polymer and a mucous surface. It is believed that the mucoadhesive nature of the device can increase the residence time of the drug in the body. The bioavailability of the drug is improved because of the combined effects of the direct drug absorption and the decrease in excretion rate. Increased residence time and adhesion may lead to lower API concentrations and lower administration frequency to achieve the desired therapeutic outcome 9. Quick adherence to the buccal mucosa and sufficient mechanical strength. Drug release in a controlled fashion. Facilitates the rate and extent of drug absorption. Should have good patient compliance. Should not hinder normal functions such as talking, eating and drinking. Should accomplish unidirectional release of drug towards the mucosa. Should not aid in development of secondary infections such as dental caries. Possess a wide margin of safety both locally and systemically. Should have good resistance to the flushing action of saliva. The buccal mucosa is relatively permeable with a rich blood supply, robust in comparison to the other mucosal tissues. Bypass the first-pass effect and non-exposure of the drugs to the gastrointestinal fluids. Easy access to the membrane sites so that the delivery system can be applied, localized and removed easily. Improve the performance of many drugs, as they are having prolonged contact time with the mucosa. High patient acceptance compared to other non-oral routes of drug administration. Tolerance (in comparison with the nasal mucosa and skin) to potential sensitizers. Increased residence time combined with controlled API release may lead to lower administration frequency. Additionally significant cost reductions may be achieved and dose-related side effects may be reduced due to API localization at the disease site. As a result of adhesion and intimate contact, the formulation stays longer at the delivery site improving API bioavailability using lower API concentrations for disease treatment. Harsh environmental factors that exist in oral delivery of a drug are circumvented by buccal drug delivery. It offers a passive system of drug absorption and does not require any activation. The presence of saliva ensures relatively large amount of water for drug dissolution unlike in case of rectal or transdermal routes. Provides an alternative route for the administration of various hormones, narcotic analgesics, steroids, enzymes, cardiovascular agents etc. It allows the local modification of tissue permeability, inhibition of protease activity and reduction in immunogenic response. Thus, delivery of therapeutic agents like peptides, proteins and ionized species can be done easily. Limited absorption area- the total surface area of the membranes of the oral cavity available for drug absorption is 170 cm2 of which ~50 cm2 represents non-keratinized tissues, including buccal membrane. Barrier properties of the mucosa. The continuous secretion of the saliva (0.5-2 l/day) leads to subsequent dilution of the drug. The hazard of choking by involuntarily swallowing the delivery system is a concern. Swallowing of saliva can also potentially lead to the loss of dissolved or suspended drug and ultimately the involuntary removal of the dosage form. Anatomy of the oral mucosa 20: Light microscopy reveals several distinct patterns of maturation in the epithelium of the human oral mucosa based on various regions of the oral cavity. Three distinctive layers of the oral mucosa are the epithelium, basement membrane, and connective tissues. The oral cavity is lined with the epithelium, below which lies the supporting basement membrane. 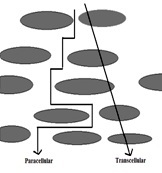 The basement membrane is, in turn, supported by connective tissues ( 1). The epithelium, as a protective layer for the tissues beneath, is divided into (a) non-keratinized surface in the mucosal lining of the soft palate, the ventral surface of the tongue, the floor of the mouth, alveolar mucosa, vestibule, lips, and cheeks, and (b) keratinized epithelium which is found in the hard palate and non-flexible regions of the oral cavity. The epithelial cells, originating from the basal cells, mature, change their shape, and increase in size while moving towards the surface. The thickness of buccal epithelium in humans, dogs, and rabbits has been determined to be approximately 500–800 µm. The basement membrane forms a distinctive layer between the connective tissues and the epithelium. It provides the required adherence between the epithelium and the underlying connective tissues, and functions as a mechanical support for the epithelium. The underlying connective tissues provide many of the mechanical properties of oral mucosa. The buccal epithelium is classified as a non-keratinized tissue. It is penetrated by tall and conical-shaped connective tissues. These tissues, which are also referred to as the lamina propria, consist of collagen fibers, a supporting layer of connective tissues, blood vessels, and smooth muscles. The rich arterial blood supply to the oral mucosa is derived from the external carotid artery. The buccal artery, some terminal branches of the facial artery, the posterior alveolar artery, and the infra-orbital artery are the major sources of blood supply to the lining of the cheek in the buccal cavity. A gel-like secretion known as mucus, which contains mostly water-insoluble glycoproteins, covers the entire oral cavity. Mucus is bound to the apical cell surface and acts as a protective layer to the cells below. It is also a visco-elastic hydrogel, and primarily consists of 1-5% of the above-mentioned water insoluble glycoproteins, 95-99% water, and several other components in small quantities, such as proteins, enzymes, electrolytes, and nucleic acids. This composition can vary based on the origin of the mucus secretion in the body. Paracellular (intercellular, passing around the cell). Permeation across the buccal mucosa has been reported to be mainly by the paracellular route through the intercellular lipids produced by membrane-coating granules (fig. 2). Barriers to penetration across buccal mucosa 10: The barriers such as saliva, mucus, membrane coating granules, basement membrane etc., retard the rate and extent of drug absorption through the buccal mucosa. The main penetration barrier exists in the outermost quarter to one third of the epithelium. Membrane Coating Granules or Cored Granules: In non keratinized epithelia, the accumulation of lipids and cytokeratins in the keratinocytes is less evident and the change in morphology is far less marked than in keratinized epithelia. The mature cells in the outer portion of non-keratinized epithelia become large and flat retain nuclei and other organelles and the cytokeratins do not aggregate to form bundles of filaments as seen in keratinizing epithelia. As cells reach the upper third to quarter of the epithelium, membrane-coating granules become evident at the superficial aspect of the cells and appear to fuse with the plasma membrane so as to extrude their contents into the intercellular space. The membrane-coating granules found in non-keratinizing epithelia are spherical in shape, membrane-bounded and measure about 0.2 μm in diameter. Such granules have been observed in a variety of other human non keratinized epithelia, including uterine cervix and esophagus. However, current studies employing ruthenium tetroxide as a post-fixative indicate that in addition to cored granules, a small proportion of the granules in non-keratinized epithelium do contain lamellae, which may be the source of short stacks of lamellar lipid scattered throughout the intercellular spaces in the outer portion of the epithelium. In contrast to the intercellular spaces of stratum corneum, those of the superficial layer of non-keratinizing epithelia contain electron lucent material, which may represent non-lamellar phase lipid, with only occasional short stacks of lipid lamellae. 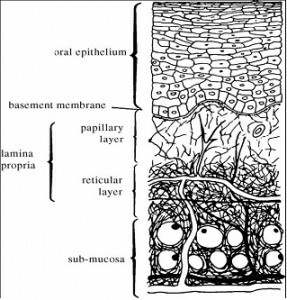 Basement Membrane: Although the superficial layers of the oral epithelium represent the primary barrier to the entry of substances from the exterior, it is evident that the basement membrane also plays a role in limiting the passage of materials across the junction between epithelium and connective tissue. A similar mechanism appears to operate in the opposite direction. The charge on the constituents of the basal lamina may limit the rate of penetration of lipophilic compounds that can traverse the superficial epithelial barrier relatively easily. Mucus: The epithelial cells of buccal mucosa are surrounded by the intercellular ground substance called mucus with the thickness varies from 40 μm to 300 μm .Though the sublingual glands and minor salivary glands contribute only about 10% of all saliva, together they produce the majority of mucus and are critical in maintaining the mucin layer over the oral mucosa. It serves as an effective delivery vehicle by acting as a lubricant allowing cells to move relative to one another and is believed to play a major role in adhesion of mucoadhesive drug delivery systems. At buccal pH, mucus can form a strongly cohesive gel structure that binds to the epithelial cell surface as a gelatinous layer. Mucus molecules are able to join together to make polymers or an extended three-dimensional network. Different types of mucus are produced, for example G, L, S, P and F mucus, which form different network of gels. Other substances such as ions, protein chains, and enzymes are also able to modify the interaction of the mucus molecules and, as a consequence, their biophysical properties. Mucus is composed chiefly of mucins and inorganic salts suspended in water. Mucins are a family of large, heavily glycosylated proteins composed of oligosaccharide chains attached to a protein core. Three quarters of the protein core are heavily glycosylated and impart a gel like characteristic to mucus. The dense sugar coating of mucins gives them considerable water-holding capacity and also makes them resistant to proteolysis, which may be important in maintaining mucosal barriers. Khanvilkar et al., have studied various methods for mucous permeability. They concluded that the tertiary conformation of the glycoproteins and their resulting interactions with water and with other mucins determines the mucus gel’s structural characteristics. The observed variability in experimental data regarding the barrier properties of mucus suggests that the macromolecular structure of mucus is extremely sensitive to its environment. Changes in pH, ionic strength, and the presence of other agents (i.e., drugs) can all affect the self-association of mucin macromolecules 24. A thorough understanding of the glycoprotein mucin component is very important with regard to understanding the properties of mucus (Fig. 3). Mucin glycoproteins may be described as consisting of a basic unit made from a single-chain polypeptide backbone with two distinct regions 24. 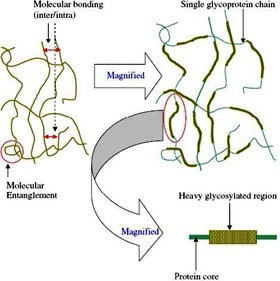 A heavy glycosylated central protein core to which many large carbohydrate side chains are attached, predominantly via O-glycosidic linkages. One or two terminal peptide regions where there is little glycosylation. These regions are often referred to as ‘naked protein regions’. Mucins are secreted as massive aggregates by prostaglandins with molecular masses of roughly 1 to 10 million Da. Within these aggregates, monomers are linked to one another mostly by non-covalent interactions, although intermolecular disulphide bonds also play a role in this process. Oligosaccharide side chains contain an average of about 8–10 monosaccharide residues of five different types namely L-fucose, D-galactose, N-acetyl-D-glucosamine, N-acetyl-D-galactosamine and sialic acid. Amino acids present are serine, threonine and proline. Because of the presence of sialic acids and ester sulfates, mucus is negatively charged at physiological salivary pH of 5.8–7.4. Saliva: The mucosal surface has a salivary coating estimated to be 70 μm thick, which act as unstirred layer. Within the saliva there is a high molecular weight mucin named MG1 that can bind to the surface of the oral mucosa so as to maintain hydration, provide lubrication, concentrate protective molecules such as secretory immunoglobulins, and limit the attachment of microorganisms. Several independent lines of evidence suggest that saliva and salivary mucin contribute to the barrier properties of oral mucosa. The major salivary glands consist of lobules of cells that secrete saliva; parotids through salivary ducts near the upper teeth, submandibular under the tongue, and the sublingual through many ducts in the floor of the mouth. Besides these glands, there are 600–1000 tiny glands called minor salivary glands located in the lips, inner cheek area (buccal mucosa), and extensively in other linings of the mouth and throat. Total output from the major and minor salivary glands is termed as whole saliva, which at normal conditions has flow rate of 1–2 ml/min. Greater salivary output avoids potential harm to acid-sensitive tooth enamel by bathing the mouth in copious neutralizing fluid. With stimulation of salivary secretion, oxygen is consumed and vasodilator substances are produced; and the glandular blood flow increases, due to increased glandular metabolism. Saliva is composed of 99.5% water in addition to proteins, glycoproteins and electrolytes. It is high in potassium (7×plasma), bicarbonate (3×plasma), calcium, phosphorous, chloride, thiocyanate and urea and low in Na (1/10×plasma). The normal pH of saliva is 5.6–7. Saliva contains enzymes namely α-amylase (breaks 1–4 glycosidic bonds), lysozyme (protective, digests bacterial cell walls) and lingual lipase (break down the fats). It moistens the mouth, initiates digestion and protects the teeth from decay. It also controls bacterial flora of the oral cavity. Because saliva is high in calcium and phosphate, it plays a role in mineralization of new teeth repair and precarious enamel lesions. It protects the teeth by forming “protective pellicle”. This signifies a saliva protein coat on the teeth, which contains antibacterial compounds. Thus, problems with the salivary glands generally result in rampant dental caries. Lysozyme, secretory IgA, and salivary peroxidase play important roles in saliva's antibacterial actions. Lysozyme agglutinates bacteria and activates autolysins. Ig A interferes with the adherence of microorganisms to host tissue. Peroxidase breaks down salivary thiocyanate, which in turn, oxidizes the enzymes involved in bacterial glycolysis. However, salivary flow rate may play role in oral hygiene. Intraoral complications of salivary hypofunction may cause candidiasis, oral lichen planus, burning mouth syndrome, recurrent aphthous ulcers and dental caries. A constant flowing down of saliva within the oral cavity makes it very difficult for drugs to be retained for a significant amount of time in order to facilitate absorption in this site. The other important factor of great concern is the role of saliva in development of dental caries. Salivary enzymes act on natural polysaccharidic polymers that hasten the growth of mutants of streptococci and other plaque bacteria leading to development of dental caries. Permeabilities between different regions of the oral cavity vary greatly because of the diverse structures and functions. In general, the permeability is based on the relative thickness and degree of keratinization of these tissues in the order of sublingual>buccal> palatal. The permeability of the buccal mucosa was estimated to be 4–4000 times greater than that of the skin. Formulation Considerations: For buccal drug delivery, it is cardinal to prolong and augment the contact between API and mucosa to obtain the desired therapeutic effect. Buccal adhesive drug delivery systems with the size 1-3 cm2 and a daily dose of 25 mg or less are preferable. The maximal duration of buccal delivery is approximately 4-6 h 25. To comply with the therapeutic requirements, the excipients or functional agents used in formulation for buccal drug delivery are mentioned below as per their categories. Also the excipients used in the formulation should be GRAS-listed i.e., Generally Recognized as Safe. Mucoadhesive polymers: Polymer is a generic term used to describe a very long molecule consisting of structural units and repeating units connected by covalent chemical bonds. The term is derived from the Greek words: polys meaning many and more meaning parts 26. Mucoadhesives are synthetic or natural polymers that interact with the mucus layer covering the mucosal epithelial surface and main molecules constituting a major part of mucus. The concept of mucoadhesives has alerted many investigators to the possibility that these polymers can be used to overcome physiological barriers in long-term drug delivery27. The development of Orahesive® followed, leading to trials of Orabase® in 1959. Orabase® was formulated from natural gums and represented the first purposely developed mucoadhesive. Orabase® product (Adcortyl in Orabase®) provides local relief of mouth ulcers via a twofold mechanism: barrier function and an anti-inflammatory function (due to triamcinolone acetonide) 7. Classification: In general, adhesive polymers can be classified as synthetic vs. natural, water-soluble vs. water insoluble, and charged vs. uncharged polymers. Table 1 summarizes the mucoadhesive polymers used in buccal drug delivery 20. The polymers most commonly used in buccal dry or partially hydrated dosage forms include polyacrylic acid (PAA), polyvinyl alcohol (PVA), sodium carboxy methylcellulose (NaCMC), hydroxypropylmethyl cellulose (HPMC), hydroxyethylcellulose (HEC), hydroxy propylcellulose (HPC) and sodium alginate 28-34. New generation of mucoadhesive polymers (with the exception of thiolated polymers) can adhere directly to the cell surface, rather than to the mucus. They interact with the cell surface by means of specific receptors or covalent bonding instead of non-specific mechanisms, which are characteristic of the previous polymers. Examples of such are the incorporation of L-cysteine into thiolated polymers and the target-specific, lectin-mediated adhesive polymers. These classes of polymers hold promise for the delivery of a wide variety of new drug molecules, particularly macromolecules, and create new possibilities for more specific drug-receptor interactions and improved targeted drug delivery 20. Thiolated polymers or designated thiomers are mucoadhesive basis polymers, which display thiol bearing side chains 35. These polymers are obtained by addition of conjugated sulfidryl groups 36. Thiolated polymers are a type of second-generation mucoadhesive polymer derived from hydrophilic polymers such as polyacrylates, chitosan or deacetylated gellan gum. Table 2 lists typical hydrophilic polymers that have been thiolated and the subsequent effect on mucoadhesive bond strength. The presence of thiol groups allows the formation of covalent bonds with cysteine-rich sub domains of the mucus gel layer, leading to increased residence time and improved bioavailability 7. Chitosan iminothiolane 250-fold improved mucoadhesive properties. Poly(acrylic acid)-cysteine 100-fold improved mucoadhesive properties. In recent years, lectins have been studied as specific bioadhesives for drug delivery in the oral cavity 37. Their peculiarity lies in the mucoadhesion mechanism: such substances are able to recognize and bind some specific sugar residues on mucosal surface without altering the structure of the recognized ligand 38. Recently, lamellar and cubic liquid crystalline phases of glyceryl monooleate (GMO) have shown mucoadhesive properties and feasibility to be used as carriers for buccal drug delivery 39. Mechanism of Mucoadhesion 40: The mechanism of adhesion of certain macro­molecules to the surface of a mucous tissue is not well understood yet. The mucoadhesive must spread over the substrate to initiate close contact and hence increase surface contact, promoting the diffusion of its chains within the mucus. Attraction and repulsion forces arise and, for a mucoadhesive to be successful, the attraction forces must dominate. Each step can be facilitated by the nature of the dosage form and how it is administered. 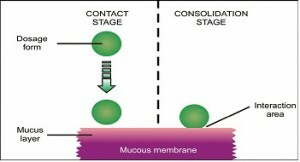 The first stage or the contact stage (Figure 4) is characterized by the contact between the mucoadhesive and the mucous membrane, with spreading and swelling of the formu­lation, initiating its deep contact with the mucus layer. In the consolidation step (Figure 4), the mucoadhe­sive materials are activated by the presence of moisture. Moisture plasticizes the system, allowing the mucoadhe­sive molecules to break free and to link up by weak van der Waals and hydrogen bonds. Theories of mucoadhesion 41: Although the chemical and physical basis of muco­adhesion are not yet well understood, there are six classi­cal theories adapted from studies on the performance of several materials and polymer-polymer adhesion which explain the phenomenon. The predominant theories on mucoadhesion are briefly described here in table 3. Electronic theory Attractive electrostatic forces between glycoprotein mucin network and the bioadhesive material. Electrons transfer occurs between the two forming a double layer of electric charge at the Surface. Wetting theory Ability of bioadhesive polymer to spread and develop intimate contact with the mucous membrane. Spreading coefficient of polymers must be positive. Contact angle between polymer and cells must be near to zero. Adsorption theory Surface force resulting in chemical bonding. Strong primary force: covalent bonds. Weak secondary forces: hydrogen bonds and van der Waal’s forces. Diffusion theory Physical entanglement of mucin strands and flexible polymer chains. For maximum diffusion and best adhesive strength, solubility parameters of the bioadhesive polymer and the mucus glycoproteins must be similar. Mechanical theory Adhesion arises from an interlocking of liquid adhesive into irregularities on the rough surface. Rough surfaces provide an increased surface area available for interaction along with an enhanced viscoelastic and plastic dissipation of energy during joint failure, which are more important in the adhesion process than a mechanical effect. Fracture theory Analyses the maximum tensile stress developed during attachment of the transmucosal DDS from the mucosal surface. Does not require physical entanglement of bioadhesive polymer chains and mucous strands, hence it is appropriate to study the bioadhesion of hard polymers which lack flexible chains. These drugs are unable to cross membrane barriers in therapeutic amounts and thus research into penetration enhancers becomes ever more important 43. A new absorption promoter for buccal delivery named lysalbinic acid has been studied using hamster cheek mucosa as a simple animal model for the initial evaluation of absorption promoters. It was shown that co-administration of lysalbinic acid with relatively small proteins (6-16 kDa), such as α-inteferon and insulin, can significantly increase their absorption via the buccal epithelium. Thus, lysalbinic acid has been shown to increase significantly permeability of the hamster oral mucosa for peptide compounds of low-to middle-molecular weight 44. Mechanism of buccal permeation enhancers 45: Table 5 provides an overview of some of the proposed mechanisms of action of penetration enhancers. Enzyme Inhibitors: The co-administration of a drug with enzyme inhibitors is another strategy for improving the buccal absorption of drugs, particularly peptides. Enzyme inhibitors, such as aprotinin, bestatin, puromycin and some bile salts stabilize protein drugs by different mechanisms, including affecting the activities of the enzymes, altering the conformation of the peptides or proteins and/or rendering the drug less accessible to enzymatic degradation 25, 46, 47. It has been shown that some mucoadhesive polymers can act as an enzyme inhibitor. The particular importance of this finding lies in delivering therapeutic compounds that are specifically prone to extensive enzymatic degradation, such as proteins and polypeptide drugs. Investigations have demonstrated that polymers, such as poly(acrylic acid), operate through a competitive mechanism with proteolytic enzymes. This stems from their strong affinity to divalent cations (Ca2+, Zn2+). These cations are essential cofactors for the metalloproteinases, such as trypsin. Circular dichroism studies suggest that Ca2+ depletion, mediated by the presence of some mucoadhesive polymers, causes the secondary structure of trypsin to change, and initiates a further autodegradation of the enzyme48, 49. Buccal Dosage Forms: Over the past few years, different dosage forms intended for buccal drug delivery have been developed. Table 6 lists the active ingredients delivered via the buccal route 21. Buccal mucoadhesive dosage forms can be categorized into three types based on their geometry illustrated in the following fig. 5. Type І: It is a single layer device with multidirectional drug release. This type of dosage form suffers from significant drug loss due to swallowing. Type ІІ: In this type, an impermeable backing layer is superimposed on top of the drug loaded bioadhesive layer, creating a double-layered device and preventing drug loss from the top surface of the dosage form into the oral cavity. Type ІІІ: This is a unidirectional release device, from which drug loss is minimal, since the drug is released only from the side adjacent to the buccal mucosa. This can be achieved by coating every face of the dosage form, except the one that is in contact with the buccal mucosa. Buccal dosage forms can also be classified as either a “reservoir” or “matrix” type. In the reservoir type, an excessive amount of the drug is present in the reservoir surrounded by a polymeric membrane, which controls the drug’s release rate. In the matrix type systems, the drug is uniformly dispersed in the polymer matrix, and drug release is controlled by diffusion through the polymer network. A number of relevant buccal mucoadhesive dosage forms have been developed for a variety of drugs. Several peptides, including thyrotropin-releasing hormone (TRH), insulin, protirelin, buserelin and oxytocin, have been delivered via the buccal route, albeit with relatively low bioavailability (0.1–5%)47 owing to their hydrophilicity and large molecular weight, as well as the inherent permeation and enzymatic barriers of the buccal mucosa. Buccal dosage forms can be used to treat both local and systemic conditions. A promising example of buccal mucoadhesive formulations for systemic use is the buccal delivery of salmon calcitonin (sCT) using thin-film composite containing 40 μg of sCT (200 IU) 50. The in vivo studies in female New Zealand white rabbits demonstrated a relative bioavailability of 43.8±10.9%, and the reduction in plasma calcium level after the buccal administration of sCT was comparable to that observed when sCT was administered by the intravenous route. These results indicate that therapeutically effective amounts of salmon calcitonin can be delivered to the systemic circulation via the buccal mucosa. Table 7 summarizes various buccal dosage forms described in the literature 5. Buccal Tablets: Tablets have been the most commonly investigated dosage form for buccal drug delivery. Buccal tablets are small, flat, and oval shaped dosage form and unlike conventional tablets allow for drinking and speaking without major discomfort. They soften, adhere to the mucosa and are retained in position until dissolution and/or release is complete 17. List of investigated buccal mucoadhesive tablets is given in the following table 8. Monolithic and two-layered matrix tablets have been designed for buccal drug delivery. In Fig. 6, a schematic representation of several kinds of matrix tablets is given 5. Bioadhesive tablets may be prepared using different methods such as direct compression or wet granulation technique. For buccal drug delivery, the tablets which are inserted into the buccal pouch may dissolve or erode; therefore, they must be formulated and compressed with sufficient pressure only to give a hard tablet. To enable or to achieve unidirectional release of drug, water impermeable materials, such as ethylcellulose, hydrogenated castor oil, etc. may be used either by compression or by spray coating to coat every face of the tablet except the one that is in contact with the buccal mucosa. If necessary, the drug may be formulated in certain physical states, such as microspheres, prior to direct compression in order to achieve some desirable properties, e.g. enhanced activity and prolonged drug release 54. Buccal patches: Buccal patches are described as laminates which comprise of an impermeable backing layer, a drug-containing reservoir layer which releases the drug in a controlled manner, and a bioadhesive surface for mucosal attachment. Two methods, namely, solvent casting method and direct milling are used to prepare adhesive patches. In the solvent casting method, the intermediate sheet from which patches are punched is prepared by casting the solution of the drug and polymer(s) onto a backing layer sheet, and subsequently allowing the solvent(s) to evaporate. In the direct milling method, formulation constituents are homogeneously mixed and compressed to the desired thickness, and patches of predetermined size and shape are then cut or punched out. Also to control the direction of drug release, prevent drug loss, and minimize deformation and disintegration of the device during the application period, an impermeable backing layer may be applied. The drugs and polymers that have been used to develop buccal patches are listed in table 9 as given below. Buccal films: In recent times, a number of mucoadhesive dosage forms for buccal drug delivery have been developed such as tablet, films, patches, discs, ointments and gels 74-75 and 90-97. However, buccal films are preferable over mucoadhesive discs and tablets in terms of patient comfort and flexibility and they ensure more accurate drug dosing and longer residence time compared to gels and ointments. Buccal films also reduce pain by protecting the wound surface and hence increase the treatment effectiveness 98. An ideal buccal film should be flexible, elastic, and soft yet strong enough to withstand breakage due to stress from activities in the mouth. Moreover, it should also possess good mucoadhesive strength so that it is retained in the mouth for the desired duration 99. The drugs and polymers that have been used to develop buccal mucoadhesive films are listed in table 10. Buccal gels and ointments: These are semisolid dosage forms having the advantage of easy dispersion throughout the oral mucosa. The problem of poor retention of gels at the application site has been overcome by using bioadhesive formulations. Certain bioadhesive polymers for example, sodium carboxymethylcellulose82 undergo a phase change from a liquid to a semisolid. This change enhances or improves the viscosity, resulting in sustained or controlled release of drugs. The drugs and polymers used for buccal mucoadhesive gels are listed in table 11. Innovative Drug Delivery Systems: Innovative drug delivery systems comprise use of lipophilic gel, buccal spray and phospholipid vesicles to deliver peptides via the buccal route. The use of cubic and lamellar liquid crystalline phases of glyceryl monooleate as buccal drug carrier for peptide drugs has also been proposed. A novel liquid aerosol formulation (Oralin, Generex Biotechnology) 119 has been recently developed, and it is now in clinical phase III trials. This system allows precise insulin dose delivery via a metered dose inhaler in the form of fine aerosolized droplets directed into the mouth. Levels of drug in the mouth are dramatically increased compared with conventional technology. This oral aerosol formulation is rapidly absorbed through the buccal mucosal epithelium, and it provides the plasma insulin levels necessary to control postprandial glucose rise in diabetic patients. This novel, pain-free, oral insulin formulation has a number of advantages including rapid absorption, a simple (user-friendly) administration technique, precise dosing control (comparable to injection within one unit) and bolus delivery of drug. Phospholipid deformable vesicles, transfersomes, have been recently devised for the delivery of insulin in the buccal cavity 120. They are morphologically similar to liposomes but differ on account of function. Transferomes respond to external stresses by rapid shape transformations requiring low energy. This high deformability allows them to deliver drugs across epithelial barriers. To prepare these vesicles, surfactants, such as sodium cholate or sodium dehoxycholate are incorporated into the vesicular membrane. The insulin administration in rabbits surpasses that seen with traditional liposomes: compared with subcutaneous administration of insulin solution, the bioavailability of deformable vesicles was significantly greater than that of the conventional vesicles. Commercial Technologies and Marketed Products: Marketed formulations or formulations under research in clinical trials for buccal drug delivery are listed in table 12 5. CONCLUSION: In the past few decades, research in buccal drug delivery has revealed remarkable growth and advances. The transmucosal route is becoming more and more popular because it does have significant advantages like avoidance of first pass metabolism in the liver and pre-systemic elimination in the gastrointestinal tract. Buccal drug delivery holds a great promise for systemic delivery of orally inefficient drugs as well as a feasible and attractive alternative for non-invasive delivery of potent peptide and protein drug molecules. Despite the advantages of delivering drugs through buccal mucosa, this route is still very challenging, with the main obstacles being the limited absorption area and the barrier properties of the mucosa. The strategies studied to overcome such obstacles include use of materials that combine mucoadhesive, enzyme inhibitory and penetration enhancer properties and the design of novel formulations, which besides improving patient compliance favor an intimate and prolonged contact of the drug with the absorption mucosa. New and unforeseen challenges are expected in the use of mucoadhesives for the delivery of new drugs and in the search of ideal mucoadhesives. Efforts have to be made to develop standardized in vitro and ex vivo biological models that allow one to characterize and compare different material and formulation in terms of their capability to promote drug absorption via the buccal route. Joseph A. DiMasi et al., The price of innovation: new estimates of drug development costs, Journal of Health Economics 2003; 22: 151-185. Mathias N.R. and Hussain A.M, Non-invasive systemic drug delivery: developability considerations for alternate routes of administration, J. Pharm. Sci. 2010; 99:1-20. Shojaei Amir H, Buccal Mucosa as a route for systemic drug delivery, Journal of Pharmacy and Pharmaceutical Sciences 1998; 1(1):15-30. Hoogstraate Janet A.J. and Wertz P.W., Drug delivery via the buccal mucosa, Pharm Sci Technolo Today 1998; 1(7): 309-316. Rossi Silvia et al., Buccal drug delivery: A challenge already won?, Drug Discov Today Technol 2005; 2(1): 59-65. Smart JD, The basics and underlying mechanisms of mucoadhesion. Adv Drug Deliv Rev 2005; 57: 1556-1568. Andrews Gavin P. et al., Mucoadhesive polymeric platforms for controlled drug delivery, Eur J Pharm Biopharm 2009; 71:505-518. Schnürch A. Bernkop, Mucoadhesive polymers: strategies, achievements and future challenges, Adv Drug Deliv Rev 2005; 57:1553-1555. Huang Y et al., Molecular aspects of muco-and bioadhesion: Tethered structures and site-specific surfaces, J Control Release 2000; 65: 63-71. S. Yajaman et al., Buccal bioadhesive drug delivery – A promising option for orally less efficient drugs, J Control Release 2006; 114: 15-40. Dixit R.P and Puthli S.P., Oral strip technology: Overview and future potential, J Control Release 2009; 139: 94-107. 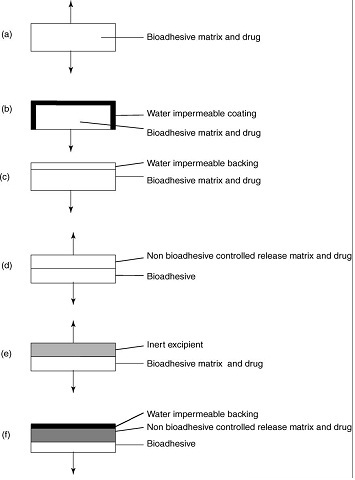 Lee Jin W. et al., Bioadhesive-based dosage forms: the next generation, J. Pharm. Sci. 2000; 89:850-866. Colonna Claudia, Innovative drug delivery systems for challenging molecules, Scientifica Acta 2007; 1(1): 70-77. Khairnar G.A. and Sayyad F.J., Development of buccal drug delivery system based on mucoadhesive polymer, International Journal of Pharm Tech Research 2010; 2(1): 719-735. Madhav N.V. Satheesh et al., Orotransmucosal drug delivery systems: A review, J Control Release 2009; 140: 2-11. Vyas S.P. and Khar R.K., Controlled drug delivery-concepts and advances. Vallabh Prakashan, first edition, New Delhi, 2002. Bhalodia Ravi et al., Buccoadhesive drug delivery Systems: A review, International Journal of Pharma and Bio Sciences 2010; 1(2): 1-32. Obradovic T. and Hidalgo Ismael J., DRUG ABSORPTION Studies Biotechnology: Pharmaceutical Aspects, AAPS Press, Vol.7 (2), 2008: 167-181. Junginger H.E. et al., Recent advances in buccal drug delivery and absorption- in vitro and in vivo studies, J Control Release 1999; 149: 149-159. Miller N.S. et al., The use of mucoadhesive polymers in buccal drug delivery, Adv Drug Deliv Rev 2005; 57:1666-1691. Wani Manish S., Current status in buccal drug delivery system, Pharmainfo.net 2007; 5(2). Nicolazzo J.A. et al., Buccal penetration enhancers- How do they really work?, J Control Release 2005; 105: 1-15. Khanvilkar Kavita et al., Drug transfer through mucus, Adv Drug Deliv Rev 2001; 48:173-193. Fiebrig I. et al., Transmission electron microscopy studies on pig gastric mucin and its interactions with chitosan, Carbohydr. Polym. 1995; 28: 239-244. Alur H.H., Johnston T.P. and Mitra A.K., Encyclopedia of Pharmaceutical Technology, in: J. Swarbrick, J.C. Boylan (Eds. ), Peptides and Proteins: Buccal Absorption, Marcel Dekker Inc., New York, vol. 20 (3), 2001:193–218. Wikipedia, The free encyclopedia, http://en.wikipedia. org/wiki/. Kamath KR and Park K, Mucosal Adhesive Preparations, Encyclopedia of Pharmaceutical Technology: Swarbrick J, Boylon J.C., Marcel Dekker, New York, first edition, Vol-10, 1994:133. Rossi S. et al., Buccal delivery of acyclovir from films based on chitosan and polyacrylic acid. Pharm. Dev. Technol. 2003; 8:199–208. Perioli L. et al., Novel mucoadhesive buccal formulation containing metronidazole for the treatment of periodontal disease, J. Control Release 2004; 95:521–533. Nafee et al., Design and characterization of mucoadhesive buccal patches containing Cetylpyridinium Chloride, Acta Pharm. 2003; 53:199-212. Nafee et al., Mucoadhesive buccal patches of Miconazole Nitrate: in vitro/in vivo performance and effect of ageing, Int. J. Pharm. 2003; 264:1-14. Sharma P. and Hamsa V., Formulation and evaluation of buccal mucoadhesive patches of Terbutaline Sulfate, STP Pharma. Sci. 2001; 11:275-281. Ceschel G. et al., Design and evaluation of a new mucoadhesive bi-layered tablet containing Nimesulide for buccal administration, STP Pharma. Sci. 2001; 11:151-156. Han R.Y. et al., Mucoadhesive buccal disks for novel Nalbhupine prodrug controlled delivery: effect of formulation variables on drug release and mucoadhesive performance, Int. J. Pharm. 1999; 177: 201-209. Schnürch A.B., Thiomers: A new generation of mucoadhesive polymers, Adv Drug Deliv Rev 2005; 57:1569-1582. Grabovac V. et al.,Comparison of the mucoadhesive properties of various polymers, Adv Drug Deliv Rev 2005; 57(11):1713-1723. Smart J.D., Lectin-mediated drug delivery in the oral cavity, Adv Drug Deliv Rev 2004; 56:481-489. Smart J.D. et al., A quantitative evaluation of radiolabelled lectin retention on oral mucosa in vitro and in vivo, Eur. J. Pharm. Biopharm. 2002; 53:289-292. Lee J. and Kellaway I.W., Peptide washout and permeability from glyceryl monooleate buccal delivery systems, Drug Dev Ind Pharm 2002; 28: 1155-1162. Carvalho F.C. et al., Mucoadhesive drug delivery systems, Brazilian Journal of Pharmaceutical Sciences 2010; 46(1): 1-17. Roy S.K. and Prabhakar B., Bioadhesive polymeric platforms for transmucosal drug delivery systems- a review; Tropical Journal of Pharmaceutical Research 2010; 9(1): 91-104. Kumar et al., Mechanism of buccal permeation enhancers, Indian J. Pharm. Edu. 2002; 36(3):147-151. J. Swarbrick, J.C. Boylan. Marcel Dekker,New York, vol. 18, 1999:1-27. Starokadomskyy P.L. and Dubey I.Ya, New absorption promoter for the buccal delivery: Preparation and characterization of lysalbinic acid, Int J Pharm 2006; 308:149-154. Senel S. and Hincal A.A., Drug permeation enhancement via buccal route: possibilities and limitations, J Control Release 2001; 72: 133-144. Hao J. and Heng P.S.W., Buccal delivery systems, Drug Dev. Ind. Pharm. 2003; 29:821-832. Veuillez F., et al., Factors and strategies for improving buccal absorption of peptides, Eur. J. Pharm. Biopharm. 2001; 51:93-109. Lueben H.L. et al., Bioadhesive polymers for the peroral delivery of peptide drugs, J Control Release 1994; 29: 329-338. Lueben H.L. et al., Mucoadhesive polymers in peroral peptide drug delivery: ІІ. Carbomer and polycarbophil are potent inhibitors of the intestinal proteolytic enzyme trypsin, Pharm Res 1995; 12: 1293-1298. Cui Z., Mumper R.J, Buccal transmucosal delivery of calcitonin in rabbits using thin-film composites, Pharm Res 2002;19: 1901-1906. Sudharshini et. al., Design and evaluation of Baclofen mucoadhesive tablets, International Journal of Biomedical and Advance Research 2010; 1(1): 25-35. Pandey Sonia et al., Formulation and In-vitro evaluation of bilayered buccal tablets of carvedilol, Indian Journal of Pharmaceutical Education and Research. Jul-Sep. 2010; 44(3). Yamsani V.V. et al., Development and in vitro evaluation of buccoadhesive carvedilol tablets, Acta Pharm 2007; 57: 185-197. Giunchedi et al., Formulation and in vivo evaluation of Chlorhexidine buccal tablets prepared using drug-loaded chitosan microspheres, Eur. J. Pharm. Biopharm. 2002; 53: 233-239. Alur et al., Transmucosal sustained-delivery of Chlorpheniramine maleate in rabbits using a novel, natural mucoadhesive gum as an excipient in buccal tablets, Int J Pharm 1999; 188: 1-10. Manivannan et al., Formulation and In-Vitro evaluation of mucoadhesive buccal tablets of Diltiazem Hydrochloride, Research Journal of Pharmacy and Technology 2008; 1(4):478-80. Perioli et al., Mucoadhesive bilayered tablets for buccal sustained release of Flurbiprofen, AAPS PharmSciTech 2007; 8(3): E1-E2. Madgulkar et al., Studies on formulation development of mucoadhesive sustained release Itraconazole tablet using response surface methodology, AAPS PharmSciTech 2008; 9(3): 998-1005. Madgulkar et al., Development of buccal adhesive tablet with prolonged Antifungal activity: Optimization and ex vivo deposition studies, Indian J Pharm Sci 2009; 71(3):290-294. Anlar et al., Formulation and in Vitro-in Vivo evaluation of buccoadhesive Morphine Sulfate tablets, Pharm Res 1994; 11(2): 231-236. Park and Munday, Development and evaluation of a biphasic buccal adhesive tablet for Nicotine replacement therapy, Int. J. Pharm. 2002; 237:215– 226. Varshosaz J. et al., Development and characterization of buccoadhesive Nifedipine tablets, Eur. J. Pharm. Biopharm. 2002; 54: 135-141. Choi H.G. and Kim C.K., Development of Omeprazole buccal adhesive with stability enhancement in human saliva, J Control Release 2000; 68: 397- 404. Hassan et al., Development and evaluation of buccal bioadhesive tablet of an Anti-emetic Agent Ondansetron, AAPS PharmSciTech 2009; 10(4): 1085-1092. Metia et al., In Vitro Evaluation of novel mucoadhesive buccal tablet of Oxytocin prepared with Diospyros Peregrina Fruit Mucilages, The Pharmaceutical Society of Japan 2008;128(4):603-609. Velmurugan et al., Formulation and in-vitro evaluation of buccal tablets of Piroxicam, International Journal of PharmTech Research 2010; 2(3): 1958-1968. Shidhaye et al., Buccal drug delivery of Pravastatin Sodium, AAPS PharmSciTech 2010; 11(1): 416-424. Samani et al., Formulation and in vitro evaluation of Prednisolone buccoadhesive tablets, Il farmaco 2005; 60:339-334. Derle et al., Formulation and evaluation of buccoadhesive bi-layer tablet of Propranolol Hydrochloride, International Journal of Pharmacy and Pharmaceutical Sciences 2009; 1(1):206-212. Shukla et al., Formulation design and optimization of bucco-mucoadhesive bilayered tablet of Propranolol Hydrochloride, International Journal of Pharma and Bio Sciences 2010; 1(2):1-10. Arya et al., Development and evaluation of mucoadhesive buccal tablets of Salbutamol Sulphate, International Journal of Pharmacy and Pharmaceutical Sciences 2010; 2(2):40-2. Shivanand et al., Mucoadhesive bilayered buccal tablets of Tizanidine Hydrochloride, International Journal of PharmTech Research 2010; 2(3):1861- 1869. Chandira et al., Formulation, design and development of buccoadhesive tablets of Verapamil Hydrochloride, International Journal of PharmTech Research 2009; 1(4):1663-1677. Khairnar et al., Development of mucoadhesive buccal patch containing Aceclofenac: In Vitro evaluations, International Journal of PharmTech Research 2009; 1(4): 978-981. Adhikari et al., Formulation and evaluation of buccal patches for delivery of Atenolol, AAPS PharmSciTech June 2010. Thimmasetty et al., Design and In Vivo evaluation of Carvedilol mucoadhesive buccal patches, Pakistan Journal of Pharmaceutical Sciences 2008; 21(3):241-248. Vishnu et al., Development of mucoadhesive patches for buccal administration of Carvedilol, Current Drug Delivery 2007; 4:27-39. Attama et al., Novel buccoadhesive delivery system of Hydrochlorothiazide formulated with ethyl cellulose-hydroxypropyl methylcellulose interpolymer complex, Scientific Research and Essay 2008; 3(6): 343-347. Perioli et al., Development of mucoadhesive patches for buccal administration of Ibuprofen, J Control Release 2004; 99: 73-82. Sahni et al., Design and In Vitro characterization of buccoadhesive drug delivery system of Insulin, Indian J Pharm Sci 2008; 70:61-65. Bhanja et al., Formulation, development and evaluation of mucoadhesive buccal patches of Methotrexate, Journal of Advanced Pharmaceutical Research 2010; 1:17-25. Wong et al., Formulation and evaluation of controlled release Eudragit buccal patches, Int. J. Pharm. 1999; 178:11-22. Agarwal et al., Development and characterization of buccoadhesive patches of Pentazocine, Acta Pharmaceutica Turcica 1999; XLI (2):46-53. Kolli et al., Development of mucoadhesive patches for buccal administration of Prochlorperazine: Evaluation of In Vitro release and mechanical properties, International Journal of Pharmaceutical Sciences and Nanotechnology 2008; 1(1): 64-70. Patel et al., Design and characterization of chitosan-containing mucoadhesive buccal patches of Propranolol Hydrochloride, Acta Pharm 2007; 57: 61-72. Patel et al., Design and characterization of mucoadhesive buccal patches of Salbutamol Sulfate, Current Drug Delivery 2009; 6: 140-144. Giradkar et al., Design, development and In Vitro evaluation of bioadhesive dosage form for buccal route, International Journal of Pharma. Research and Development 2006; 2(6):1-20. Chun et al., Preparation of buccal patch composed of carbopol, polaxamer and hydroxypropyl methylcellulose, Arch Pharm Res 2003; 26(11):973-978. Deshmane et al., Chitosan based sustained release mucoadhesive buccal patches containing Verapamil HCl, International Journal of Pharmacy and Pharmaceutical Sciences 2009; 1(1):216-229. Boyapally H. et al., Controlled release from directly compressible Theophylline buccal tablets, Colloids Surf B Biointerfaces 2010; 77: 227-233. Ikinci G. et al., Development of a buccal bioadhesive Nicotine tablet formulation for smoking cessation, Int. J. Pharm. 2004; 277:173– 178. Yehia S.A. et al., Fluconazole mucoadhesive buccal films: In Vitro/In Vivo performance, Current Drug Delivery 2009; 6: 17-27. Rasool B.K.A and Khan S.A., In Vitro evaluation of Miconazole buccal films, International Journal of Applied Pharmaceutics 2010; 2(4): 23-26. Ali J., Khar R. et al., Buccoadhesive erodible disk for treatment of oro-dental infections: design and characterization, Int. J. Pharm. 2002; 283:93–103. El-Samaligy M.S. et al., Formulation and evaluation of Diclofenac sodium buccoadhesive discs, Int. J. Pharm. 2004; 286:27– 39. Morishita M. et al., Pluronic® F-127 gels incorporating highly purified unsaturated fatty acids for buccal delivery of Insulin, Int. J. Pharm. 2001; 212: 289-293. Shin et al., Enhanced bioavailability by buccal administration of Triamcinolone acetonide from the bioadhesive gels in rabbits, Int. J. Pharm. 2000; 209:37– 43. Arakawa Y et al., Effect of low-molecular-weight β-cyclodextrin polymer on release of drugs from mucoadhesive buccal film dosage form, Biol Pharm Bull 2005; 28:1679-1683. Patel V. M. et al., Effect of hydrophilic polymers on buccoadhesive Eudragit patches of Propranolol Hydrochloride using factorial design, AAPS PharmSciTech 2007; 8(2):1-8. Satishbabu B.K. and Srinivasan B.P., Preparation and evaluation of buccoadhesive films of Atenolol, Indian J Pharm Sci 2008; 70(2):175-179. Viram J Parmar et al., Formulation, development and evaluation of buccal films of Carvedilol, Indian Journal of Pharmaceutical Sciences and Research 2010; 1(8): 149-156. Juliano et al., Preparation, In Vitro characterization and preliminary In Vivo evaluation of buccal polymeric films containing Chlorhexidine, AAPS PharmSciTech 2008; 9(4): 1153-1158. Choudhary et al., Development and characterization buccoadhesive film of Ciprofloxacin Hydrochloride, International Journal of PharmTech Research 2010; 2(2):1050-1057. Kumar et al., Design and In Vitro evaluation of mucoadhesive buccal films containing Famotidine, International Journal of Pharmacy and Pharmaceutical Sciences 2010; 2(3):86-90. Consuelo et al., Ex vivo evaluation of bioadhesive films for buccal delivery of Fentanyl, J Control Release 2007; 122: 135-140. Mura et al., Development of mucoadhesive films for buccal administration of Flufenamic Acid: effect of cyclodextrin complexation, Journal of Pharmaceutical Sciences 2010; 99: 3019-3029. Goudanavar P.S. et al., Formulation and In-Vitro evaluation of mucoadhesive buccal films of Glibenclamide, Scholars Research Library 2010; 2(1):382-387. Semalty M. et al., Development of mucoadhesive buccal films of Glipizide, International Journal of Pharmaceutical Sciences and Nanotechnology 2008; 1(2):184-190. Doijad R.C. et al., Buccoadhesive drug delivery system of Isosorbide Dinitrate: formulation and evaluation, Indian J Pharm Sci 2006; 68(6):744-748. Pillai S. et al., Design and evaluation of buccal films of Isoxsuprine hydrochloride, Research Journal of Pharmaceutical, Biological and Chemical Sciences 2010; 1(2): 158-164. 111. Alanazi F.K. et al., Formulation and physicochemical characterization of buccoadhesive films containing Ketorolac, J. Drug Del. Sci. Tech. 2007; 17(1): 1- 10. Shah D. et al., Formulation of a water soluble mucoadhesive film of Lycopene for treatment of leukoplakia, International Journal of Pharmaceutical Sciences and Research 2010; 2(1):6-10. Nagaich U. et al., Formulation and development of Metoprolol Tartrate bucco-adhesive films, The Pharma Research 2009; 1:41-53. Rao et al., Development of mucoadhesive films for buccal administration of Montelukast, International Journal of Pharmacy and Technology 2010; 2(1): 1-15. Alagsundaram M. et al., Formulation and evaluation of mucoadhesive buccal films of Ranitidine, International Journal of PharmTech Research 2009; 1(3):557-563. Kumar et al., Novel core in cup buccoadhesive systems and films of terbutaline sulphate–development and in vitro evaluation, Asian Journal of Pharmaceutical Sciences 2006; 1(3-4):175-181. Kumar et al., Formulation of thermoresponsive and buccal adhesive In Situ gel for treatment of oral thrush containing Itraconazole. J. Pharm. Sci. 2010; 2(2):116-122. Rasool et al., In Vitro release study of Nystatin from Chitosan buccal gel, Jordan Journal of Pharmaceutical Sciences 2010;3(1):44-54. Modi, G. et al., Evolving role of oral Insulin in the treatment of diabetes using a novel rapidmist system. Diabetes Metab. Res. Rev. 2002; 18:38–42. Yang, T.Z. et al. Phospholipid deformable vesicles for buccal delivery of Insulin. Chem. Pharm. Bull. 2002; 50:749–753.